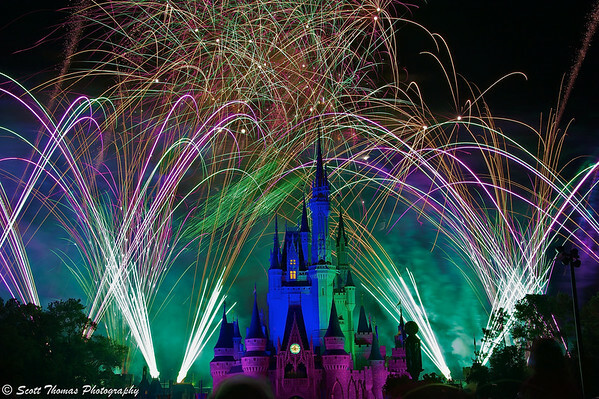 Last week I talked about how I photograph fireworks at Walt Disney World. This week I will use the same technique of a tripod, cable shutter release and setting the shutter speed to Bulb in Manual exposure mode. This allows me to control how long the shutter will be open. So, what’s different? I am adding a new piece of equipment called a Neutral Density filter to the front of the lens. Neutral Density filters allow less light to enter the lens. Think of them as sunglasses for your camera. I know what you are thinking, Scott has finally lost his mind. For years, I have been telling you to get as much light as possible through the lens to get the best exposures. However, landscape photographers for years have used neutral density filters to INCREASE the shutter times when they want to photograph moving objects in their landscapes like waterfalls. Long shutter speeds for waterfalls create the silky look of water flowing over time. The same idea works for fireworks. A neutral density filter extends the amount of time the shutter can be open without getting completely blown out explosions and rocket trails. These filters are referred to as ND and come in different strengths. I purchased a kit of three ND filters (see link below): ND2 or 0.3 (1 f-stop), ND4 or 0.6 (2 f-stops) and ND8 or 0.9 (3 f-stops). As you can see, the higher the ND number, the more light it blocks in f-stops. What it means to us is, if you leave a camera’s aperture and ISO the same, the stronger the ND filter, the longer the shutter speed. I do not want to get bogged down in photographic math but here’s an example: If I set my camera to an aperture of f/8 and ISO 200 on a bright sunny day, I get a shutter speed of 1/200th of a second. If I put an ND2 filter on the lens, the light will be cut in half or 1 full f-stop for a shutter speed of 1/100th of a second. ND4 filter makes it to 1/50th of a second and the ND8 filter brings it all the way down to 1/25th of a second. If you are photographing a moving subject, the difference between 1/200 and 1/25 is huge! More on this later. Back to our fireworks, using the Blub method and no ND filter last week, I could not go much longer than a few seconds without getting blown out (all white) fireworks explosions and trails. In fact, I did get some which I discarded. In the photos below, I used the strongest ND filter I had, the ND8 (3 f-stops). I could now hold the shutter open for 10, 20, 30, 60 seconds or maybe longer. I have seen some photos on flickr go over 120 seconds (2 minutes) for IllumiNations in Epcot and still look very colorful. In the Magic Kingdom, I set up for Wishes which is a very different fireworks show than IllumiNations. I tried some really long exposures at first which went in between the scenes of the show. They did not look to good. Running out of time, I decided to open the shutter at the beginning of a scene and close it at the end. Remember my tip on using youTube last week to learn when a scene starts and ends. Once I did that, the long exposures worked much better. The fireworks looked great just as the show Imagineers wanted them to. The first scene I want to show you is Fantasia featuring the part where Mickey Mouse is the Sorcerer’s Apprentice and gets in over his head. 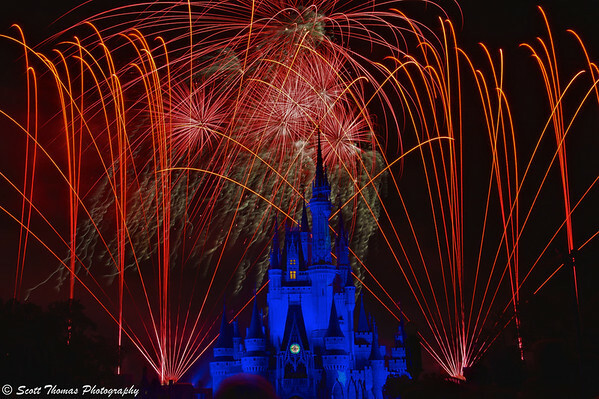 The reds of the fireworks with the blue Cinderella Castle conjures up the scene very well. The Fantasia scene from Wishes, a fireworks show, in the Magic Kingdom. Nikon D700/28-300VR, 27.8s, f/16, ISO 200, +0.3, 52mm focal length, tripod, ND8 filter. The next scene is when the Villains take over the show. Lots of strange and bright colors and villainous lighting on the castle. The Villains scene of Wishes fireworks show in the Magic Kingdom. Nikon D700/28-300VR, 66.9s, f/16, ISO 200, EV +0.3, 52mm focal length, tripod, ND8 filter. This is the first 12 seconds of the Wishes grand finale. I like this as there is neutral lighting on the castle as the fireworks frame it. Twelve seconds of the Finale of Wishes fireworks show in the Magic Kingdom. Nikon D700/28-300VR, 12s, f/16, ISO 200, EV +0.3, 52mm focal length, tripod, ND8 filter. Getting back to the math part. 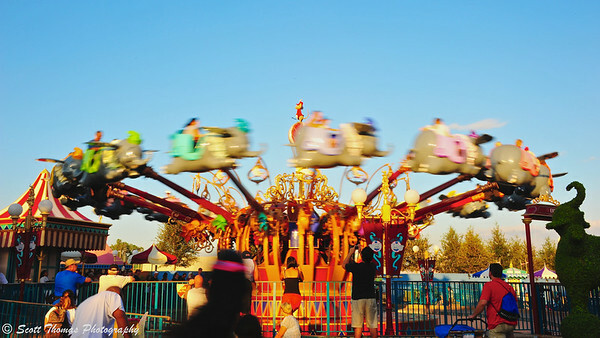 Instead of using a waterfall to demonstrate the use of a neutral density filter during the day, I used the ever popular Dumbo, the Flying Elephant, ride in Fantasyland. Without an ND filter, the slowest shutter speed I could get was 1/15th of a second at an aperture of f/25 and ISO of 200. As you can see, the Dumbos are blurred but you can still see what they are. Dumbo ride without a Neutral Density filter. I put on the ND8 filter and the shutter speed drops to a little less than 1/2 of a second. Quite the dramatic change. 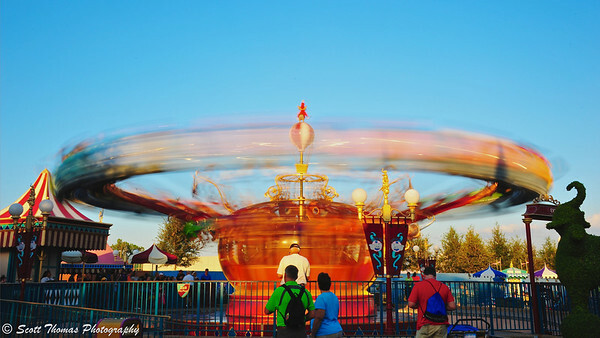 Dumbo ride with a Neutral Density filter. If you are interested in using these filters for your photography, I highly recommend the Dolica CF-NDK77 77mm 0.3, 0.6, 0.9ND Neutral Density Filter Kit. The filters are thin and can be stacked. Dolica has other filter sizes but I would look at getting step up rings so you don’t have to buy multiple filters for different sized lenses. 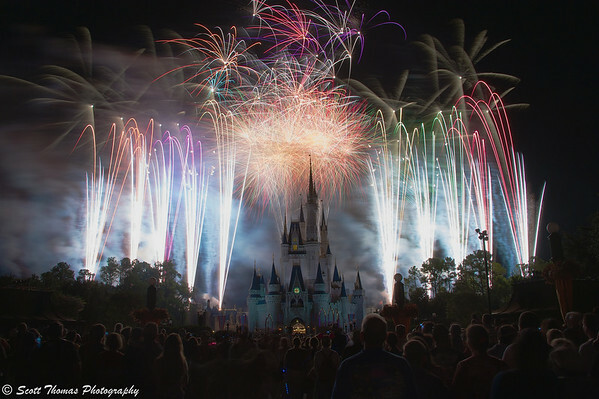 This entry was posted in Photography and tagged 28-300mm, filter, fireworks, florida, long exposure, magic kingdom, neutral density, nikon D700, Photography, tripod, vr, walt disney world, wishes. Bookmark the permalink. Very interesting, Scott. I would never have thought to use ND filters to gain a slower shutter speed. I merely thought of them as a tool used for achieving a good sky color or to darken a background. Very interesting, indeed! 🙂 Now I’m the one taking notes! I can not take credit for this idea. The Disney fan(atic) photographers have been experimenting with ND filters for the fireworks over the last year. I asked a lot of questions and determined this was the best way for me to use one. I will definitely be looking for some waterfalls to try it out on. Examining these leads me off on all sorts of tangents about “seeing”–not just the physics of what the camera is doing with light, but what the eye and brain do with the enormous data stream of human vision. It’s always interesting to have a little window open in the attic I call my mind. It was a very interesting and instructive introduction to the ND filters. A new world for me! I hope soon I get the opportunity to purchase a DSLR camera – with all the new opportunities it will offer ….! Not sure which camera you have but there might be a filter solution for it. Some P&S cameras have built in ND filters like the Canon G series, too. I just purchased a B+W two-stop (.6) graduated ND filter. I can’t wait to play with it. I saw the Dolica ND kit on Amazon and almost went for it, but decided against it (just not enough reviews). Looks like they work rather well, though. Have you noticed any image quality/distortion issues? I wish I could tell you ya or nah on the question about quality/distortion. For the little time I have used the ND8 filter of the three, I have not seen any distortion or lack of quality. For the price, I was willing to risk it but have been very happy so far. This filter set is well priced. I was getting ready to buy another kit by Tiffen at twice the cost. Thank you Twitter! As a contact of mine found them on Amazon. Love using my ND8 filer, but I have never used it on fireworks. I use mine for flowing water and waterfalls. Great work Scott, I really like the last image. I will use them more often for those subjects, Mike. I have seen yours and Conseulo’s photos using them and knew I would get a set one day. The fireworks photos on flickr at Disney just had to be tried out! The photos are very different than with traditional lenses. I am sure I will find other interesting subjects to use them on, too. Nicely done on the fireworks, a great demonstration of the value of a ND filter set. Thanks for the ideas. Nice Scott! Great post and really nice photos. I have a ND4 filter that I haven’t played with much yet – in fact, I don’t think I’ve even used it once. I got it specifically for the waterfall in Canada at Epcot. I’ll have to try it on the fireworks when I’m there in January. Not sure about that Dumbo picture though. It makes me kind of nauseous just looking at it! 🙂 The Dumbo photos were just a demonstration of what an ND filter does for moving objects. Another idea is for ocean surf to really smooth out the moving water. Yes, the waterfall in Epcot’s Canada pavilion would be a good one. There are a few at Disney’s Animal Kingdom, too. I really liked this post and will save it for future reference. Thanks! The photos are wonderful! Great post. I had already purchased a Tiffen .9 and just received a Tiffen .6. I am looking forward to using both when we go to WDW in two weeks, your post gives me a good starting point. I am also going to use your tip on viewing youtube to get some timing down. Great shots too! Have fun, Harry! Epcot should have the Holiday ending for IllumiNations by then. Stack both filters and you might…might be able to capture it. Please, let me know how it goes. This is very interesting Scott! I had no idea this sort of this was possible through filters. Excuse my naivite, but does the shutter speed literally drop due to the filter, or is that the effect of the filter – it appears to have dropped? I know these are tri-pod shots for that low shutter speed, but it made me curious: at how slow of a speed are you able to hand-hold a shot? Does that speed get lower with practice? Yes, the ND filters cut the amount of light entering the lens. If the aperture and ISO remain the same, the shutter speed will drop. I can consistently hand hold down to 1/15th of a second with excellent results using Nikon’s VR lenses. Here’s a link to a blog post I did about hand holding at even slower speeds: Secret to Sharp Photos. I want to buy that second one. *sings* It’s beginning to look a lot like (an expensive) Christmas! When I bought filters for my 18-200VR, I got them at 77mm and purchased a step up ring so they would fit on the lens. The 28-300VR is a 77mm filter size and I did not have to re-buy the filters. I will have to try this on New Year’s Eve. I have never attempted to take firework shots but maybe I will this year. You have inspired me. You will have fun doing it, Consuelo. This is real neat Scott, I would never have thought to use it at night. The fireworks don’t look real, I guess it’s like capturing it in slow motion and very impressive shots. Thank you, Nye! I must give credit to the many flickr Disney fan photographers who have been using this technique over the last year. I will be trying it out next year at local firework shows. Scott, I wonder if it will work the same for Christmas lighting, I’m interesting in doing time lapse video but not sure if I would have enough patient and time to get it done. Not sure, Nye. Be a fun experiment to to do. Beautiful shots gained with these filters, Scott. You did a great job! Thank you, Kathy, and welcome back!